What was Brooklyn & Slim has become Step Too Cafe. Based on the images on the sign, our best guess is that Step Too maintain the space as a bar. However, we need someone to explain the name. "Step Two" we would understand, like the step following one. "Step To" we also would understand, like stepping towards something. We're not sure how "Step Too" should be interpreted - step also? Perhaps the word "too" has additional meaning for the new proprietors. Does anyone know when this place is supposed to open? The Maple Street School is throwing a benefit to raise money for our local non-profit preschool...an Art Show and Cocktail Party! The school has been organizing workshops run by local artists and teachers for the kids of PLG to create unique works of art. The art includes watercolor self-portraits, collages, finger paint collaboratives, and more, all mounted on wood and other ready to hang materials. The results are beautiful! In addition, some grown up local artists will be showing their latest works. All the art is for sale by silent auction for the evening starting between $20-35, and on display for the month. And, introducing the newest addition to nightlife in PLG, the much anticipated Lime! Lime is cool, new lounge that hopes to also act as a community arts center with regular showings of local art and hosting community gatherings. Lou, the owner, is opening LIME to the school with generous donations! So, toast the holidays and see the inspired works of art created by the children of PLG, also great gifts for the holidays! Tickets are $20 and include unlimited beer and wine. All proceeds go to benefit the Maple Street School. Contact Lizzie at eabicknell@yahoo.com for tickets and information. ... or so we hope. Lime had its sign put up recently. As is evident in this reader-submitted photo, it's pretty damn spiffy for ol' Flatbush Ave. 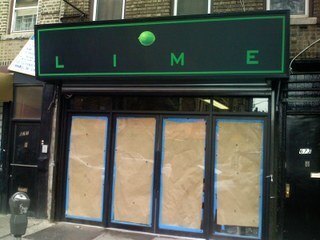 In case you need some background info, Lime is a new bar slated to open soon on Flatbush. We searched far and wide for a photo of Handyman Sports Bar, but couldn't find one. This is our best approximation based on a Google maps search (which, if you haven't noticed, now has a really cool street view feature). Back to Handyman: A friendly reader tipped us off that a notice of an application for a liquior license is currently posted in their window. We have only been inside Handyman once, and it was during a PLGArts fundraiser. Is Handyman even regularly open? We assumed it was purely a party rental space. ...appears to be not yet open. 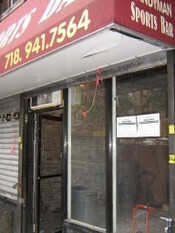 However, the exterior has been nicely vandalized since the original New Brooklyn & Slim closed. Does anyone know what's going on inside there? The dumpster is gone, but there seems to be limited to no activity taking place. Anyone know who bought the place? We miss the welcoming vibe fostered by the last owners as much as we miss the cheap beers. Josh Bernstein of New York Press has a new series going: Scary Bar Project. In a recent article he and his girlfriend visited Meytex Lounge. "Scary bars offer similar caution symbols. Chiefly darkened windows make your imagination skitter toward fisticuffs and filthy booze, bathroom blowjobs and coke bumps. “Um, I’m not going in there,” my girlfriend says, gesturing toward the blood-sausage–colored windows of Meytex Lounge. A Ghana flag decorates the green awning, the only clue to its grandeur—or god-awfulness. “It’s probably a stripper bar,” she says." The article goes on to describe the Meytex experience as good and generally non-scary. We've eaten there and found the food to be pretty good - the fried chicken being the best item. We also learned something new from Bernstein: Meytex offers some supercharged version of Guiness that will get you rrrreal drunk. Meytex will soon be undergoing a exterior cosmetic makeover, actually, as part of PLUS' storefront improvement program. Thanks for the link, Adrian! 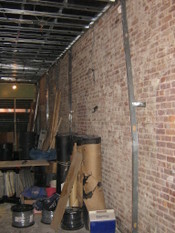 We took a swing by the old Brooklyn & Slim today to see if we could catch any renovation in action. Instead, we caught renovation inaction. Ha. If this place reopens under the same name, will it be "The New, New Brooklyn & Slim"? Either way, it looks like the old 70s lounge fixtures have been gutted out, which is too bad. 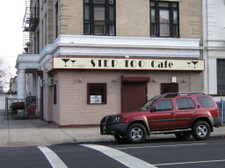 Could the combination of a newly revamped Brooklyn & Slim and Inkwell spell the beginnning of nightlife on Rogers Ave.? A reader tells us that Brooklyn & Slims is closing its doors. We've heard this as rumor before, but we hoped that it wasn't true. Our tipster tells us that Slims is to be replaced by another bar, possibly a restaurant. Still, it's too bad that Slims is closing, particularly because the current owners know how to run a bar and create a welcoming environment - unlike newer bars like Inkwell. We walked by Inkwell on Saturday after enjoying breakfast at Toomey's. We couldn't tell if Inkwell was open or not, as there was an opaque curtain across the windows accompanied by a blank whiteboard. The door was open, however, and it was dark inside. We've also heard two major pieces of feedback from potential customers: one walked in expecting to have dinner, but was told that the chef was not yet on the premises (we hypothesize that they don't actually have a chef). Another potential customer was turned away this past summer because he was wearing shorts and wasn't dressed up enough. These two incidents share one description: STUPID. But we digress. We'll miss Brooklyn & Slims.